Here’s where things stand as of Mid-January. The beginning of my week in Erin Condren planner before the pen. This is my master planner. Sort of the bible of my planners. I track bills, appointments, life tracking, dinners, spending, gratitude and high level to do lists in this monster. It’s pricey. I won’t lie about that. And I spend money on stickers, pens, paper kits and anything else people come up with. For three years running I have used this with true consistency. I open and write in this thing every single day. Because of its size, I leave it at home. I don’t worry about it being damaged by a spill in my purse or stolen or otherwise disrespected by non planner people. Pretty dashboard papers in my Pocket travelers notebook. 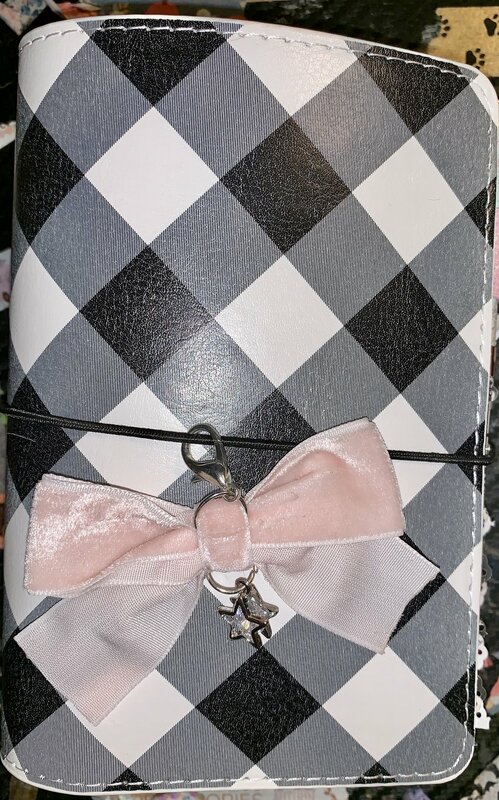 Current cover and deco for my Pocket Traveler’s Notebook. This is my leave the house planner. It fits in my purse or the backpack on my chair. I track appointments in here. I try to get them all in the Google calendar my family shares, but I miss sometimes. With all the appointments we make every month, I need pen and paper as a master. I also list all the restaurants we go to and whether I like their iced tea. Some places serve awful tasting stuff. My brain doesn’t hold on to that kind of info anymore. I also carry coupons in a little pocket folder. I keep a little notebook for color swatches of my art supplies. 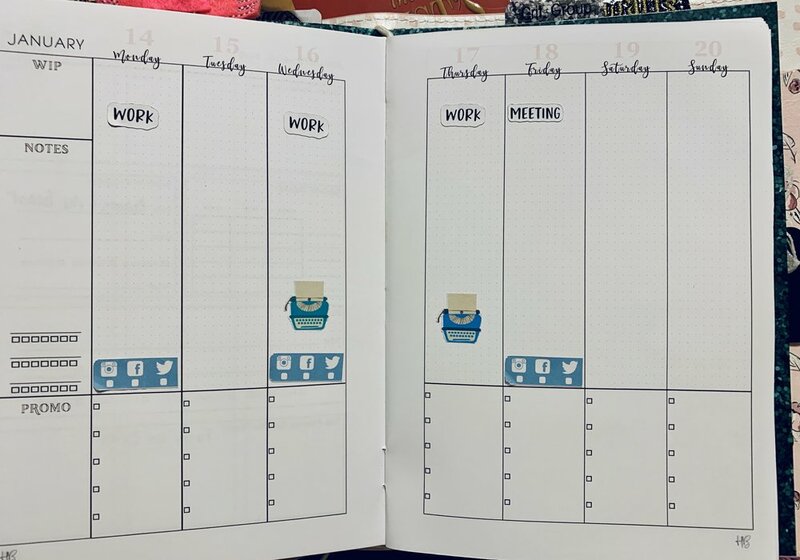 Love this planner’s versatility. I can change inserts as my needs change. For instance, at the holidays I added in a Christmas insert for keeping track of gifts, Christmas cards and hallmark movies. Once of the weekly pages in the HB90 Writer’s Planner. This is my writer life planner. It’s by Sarra Cannon and can be found on her Etsy shop. I want to talk more about the set up next week. For now, I will say it works for my brain. I can track higher level writer goals, break them into pieces over a quarter, then drill down to a week, then daily. It has a space for tracking all kinds of things. Promos? There is a spot for it. Want to write blogs? There is a space to track it. Are you in edits for a book while working on a new plot? You can track that. Social media? Yup, you can do that. It’s rather divine. I know, only three? My guy has already been making noise about taking me to Michael’s this week because he knows it’s planner nirvana time. He isn’t wrong, but I think these three are working for me. The Erin Condren and the Pocket Traveler's are the two I stuck with last year. I feel confident that today this is a good balance. Something I've not done is write a business plan for this year. I am not sure if I will. Maybe. There is value in a plan you can look at each year and track progress. On the flip side, I didn’t work much last year. Looking at all the missed goals hurt me. I don’t like not meeting my own expectations. But I am swallowing it and hoping that taking time off last year has helped fill my creative well. I want to write! Are you using a planner this year? What kind? More than one? I would love to hear from you. Please leave me a message below or hit me up on social media.